The No. 4 ranked Miller Grove Wolverines traveled to Dutchtown in the Class 5A Boys’ State Playoffs and took down the hot Bulldogs 70-56 to punch their ticket to the Final Four on Saturday at 4:00 pm at Ft. Valley State University. Dutchtown had been streaking since the Christmas break with a Region 4-5A title in tow. The Bulldogs downed Morrow 67-64 and Statesboro 75-73 to advance to the meeting with the Wolverines. The Bulldogs jumped out in front early with a 7-5 lead, but the seemingly always resilient Wolverines came back to take the lead at 9-7 and would never trail again. Miller Grove took a 16-10 lead in to the second quarter and Dutchtown playing at home rallied to within 18-17 with 4:34 left in the half. Lorenzo Anderson helped the Wolverines respond with an 8-0 run to go up 26-17 with just over two minutes remaining in the half. The Wolverines took a 35-24 lead into the half looking for that berth in the Final Four. Dutchtown was trailing 44-34 with 3:47 left in the third quarter when the balanced Miller Grove offensive attack tacked on eight quick points to make it 52-36 with 2:00 remaining in the period. Miller Grove headed into the fourth quarter up 57-41 and ran away in the first five minutes of the fourth quarter to push the lead out to 69-48. The Wolverines (22-7) cruised the rest of the way to the win. 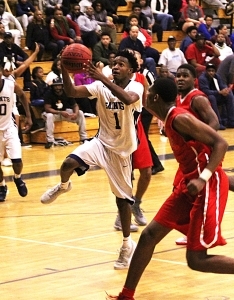 Lorenzo Anderson had a team-high 16 points to lead Miller Grove while Maurice Harvey added 14 and Kevin Paige 12. Miller Grove started basketball in 2005 and has reached at least the quarterfinals 11 of the 12 seasons they reached the state playoffs. The Wolverines earned they way into the their 10th Final Four in the last 11 playoffs seasons. In 14 seasons Miller Grove has only missed in their shortened inaugural 4-7 season in 2005 and in 2007 when the team was upset in the first round of its region tournament. The 12 playoff seasons include 7 state championships and a combined playoff record of 47-4. Coach Rasul Chester is making his second consecutive trip to the Final Four and his team will face unranked Hiram (23-9), which knocked off Starr’s Mill (23-8) 47-35, at 4:00 pm at Ft. Valley University on Saturday. In other Class 5A boys’ action, the No. 3 ranked Lithonia Bulldogs came up short against No. 2 ranked Warner Robins 67-64 to finish their season. The Bulldogs trailed just 65-64 with 11 seconds to play but Warner Robins (26-3) hit a pair of free throws to seal the win and berth in the Final Four against No. 9 Clarke Central (25-6), a 73-52 winner over No.57 Stockbridge. 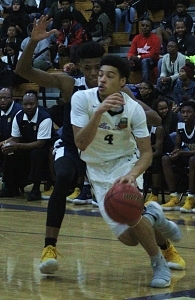 Jenkins of Savannah knocked the Cedar Grove Saints out of the playoffs for the third consecutive season with a 72-65 come-from-behind win at Cedar Grove on Wednesday night. Missed opportunities in the fourth quarter led to the end of Cedar Grove’s season despite fighting hard to get the game under control again. Jenkins was leading 61-58 following a Matthew Sams basket when the Saints’ Keshun Byrd nailed a three-pointer for the tie with 2:43 to play. Cedar Grove forced a turnover, but missed a pair of free throws and Jenkins answered with a big three from the left win by Tre’ Mays to regain the lead at 64-61 with 2:12 to play. Trailing 68-65, the Saints had the basketball with the opportunity to tie, but two three-point shots rattled out and Jenkins would hit four free throws to seal the win in the final 8.3 seconds. Cedar Grove (23-7) led only 33-28 at the half after jumping to a 20-7 advantage with 7:39 left in the second quarter. Jenkins (23-5) used that late second quarter momentum to take a 42-38 lead in the third quarter after a Nijajuan Youmans three-pointer and a layup with 3:39 remaining in the period. Tworn Seals drove to the basket and Blake Austin’s three-pointer helped the Saints regain the lead and take a 47-44 advantage into the fourth quarter. Jamari Dean finished the game with 21 points and 15 rebounds to lead Cedar Grove and was joined in double figures by Tworn Seals (15) and Keshun Byrd (12). Youmans finished with a game-high 26 points to lead Jenkins in the win.